I’ve been on a Greek yogurt kick lately, and I’ve been intrigued by the idea of baking with yogurt after the smashing success of these blueberry muffins. Yogurt is fantastic in baked goods; it imparts a light, moist texture and flavor and is so much better for you than fattening alternatives like butter, sour cream or cream cheese. Generally speaking, you should be able to replace half the amount of butter in baked goods with half the amount of Greek yogurt (e.g. 8 tablespoons of butter becomes 4, plus 2 tablespoons of yogurt). Since scones are notoriously heavy in butter, I thought they would be prime for adaptation. I attempted to replace some butter in these raspberry oatmeal scones with yogurt, while also replacing the all-purpose flour with whole wheat pastry flour. I ended up with pretty pictures of mediocre scones, so the photos joined the ranks of failed recipes in my Lightroom. That happens more often than not—I only share the absolute best on the blog. 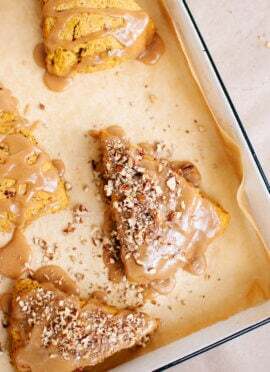 So I searched around for a whole wheat scone recipe with Greek yogurt, and eventually landed on a gorgeous post by Caroline of chocolate & carrots. It was exactly what I was looking for, so I followed her recipe closely and a mere 35 minutes later, took a bite of the best scone I’ve ever tasted. The scones are everything a scone should be: slightly crispy on the outside and delicately moist and fluffy on the inside. Not too sweet, yet packed with flavor. Thanks to the lighter texture of whole wheat pastry flour, they don’t taste like heavy, nutty whole wheat scones. The Greek yogurt lends moistness and a slight tang, which plays nicely with the lemon zest. Truly, I believe this is the scone recipe to end all scone recipes. Not convinced? Let’s examine the reaction of two grown boys who had the fortune of walking into my kitchen the day I baked these scones. After one bite, the first yelped in delight and cursed its perfection. That night, the other boy practically waltzed around the kitchen, mm-mming as he relished every last bite of his scone. The latter may have had a few drinks beforehand, but I assure you that these boys don’t normally get excited about scones. They’re just that good. If you’ve been intimidated by baking scones, don’t be afraid to try this recipe. I was surprised at how easy it was to throw the ingredients together. Shaping and slicing the scones was easy, too. Make them for breakfast this weekend, and freeze the rest for later! 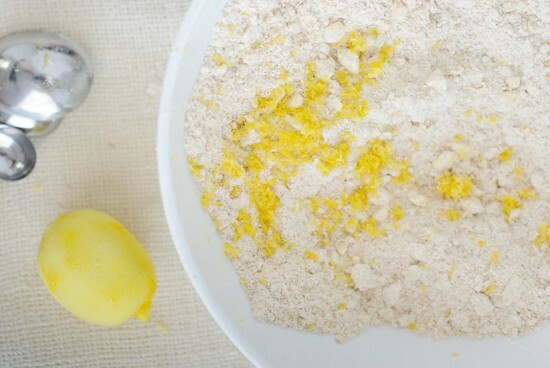 Combine flours, baking powder, sugar and salt in a bowl and whisk together. Add blueberries and lemon zest and gently stir. 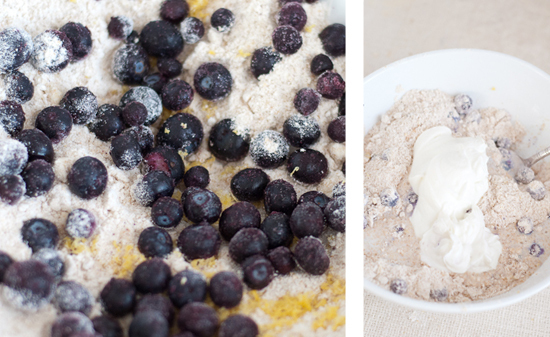 You can use frozen blueberries, no thawing necessary. Gently mix in milk and yogurt. Eventually you’ll need to use your hands to knead the last of the flour into the dough. Form dough into a circle about that’s about an inch deep all around. Cut the circle into 8 slices. Separate slices and place on a baking sheet covered in parchment paper or foil. Sprinkle the tops of the scones with a bit of raw sugar. Bake for 15 minutes or until light brown. Recipe mildly adapted from Chocolate & Carrots. Thank you for the recipe, Caroline! I’m so glad I found your blog the other day. Your recipes are fantastic! I found so many I want to try. Hi Kate, I’m so glad I just came across your lovely blog! You have so many tasty recipes and your photos are gorgeous. And Cookie is just the cutest dog. :-) I also have a mutt (named Felix, but she’s a girl) that we rescued from the street when she was a tiny puppy. Looking forward to following your blog. Have a great day, Karen. Thank you, Karen! I’m glad you found my little blog. I’d love to see pictures of Felix! im not much of a scone maker but i think i will give this a go soon! looks pretty amazing – just need get my hands on some WW pastry flour – haven’t seen any around here before! Hey Vivienne, I hope you try this scone recipe! I was surprised at how easy they are to make. I find whole wheat pastry flour at our local health food stores. Thank you for your kind words about my photos. I feel like I still have so much to learn! Your question isn’t silly at all. I use Adobe Lightroom to organize and edit my photos. If I want to create a photo collage (the two photos in one), I open the edited photos in Photoshop and paste them into some really basic templates I set up. I have not found a way to create a collage in Lightroom. I love Lightroom and wouldn’t be able to go without it, so if you have to pick one program and do a lot of photo editing, I would go with Lightroom. If you happen to have a Mac, you could also buy a cheap program by Apple called Pages. My friend swears by it for making collages—I have never figured out how to use it that way, but it looks easy, and Pages only costs around $20 in the app store. thanks for the detailed response Kate! yeah i do feel like there’s so much to learn in photography – but it is a lot of fun and a joy when the final image turns out the way i intended it! Thanks for posting this! I made these scones this evening and they turned out really well. I usually use buttermilk when baking scones, but I really liked the non-fat greek yogurt/milk combo in this recipe. They still had the tang I like from the buttermilk but they seemed lighter and much more moist. And to finish off the scones, I reserved some of the liquid and used it as a wash to coat the scones and I sprinkled the tops with some more turbinado sugar. They browned nicely and the sugar added to the crunch. I just found your blog and LOVE it. The pictures are so vibrant, I want to reach into my computer and taste everything! Anyways, I just wanted to thank you for the scone recipe. I’ve been searching for a healthy scone recipe for a while now and yours has become my standard. I’m making my third batch today (although I think I’ll try substituting apples and cinnamon since I ran out of blueberries). Thanks again! Thank you so much for commenting, Molly! I’m glad you love the scones. I just can’t get enough of them. How did the apples and cinnamon turn out in your third batch? That sounds perfect for fall! These look delish! I can’t wait to try them. Can i use regular sugar or another sweetener in place of the turbinado sugar if I don’t have it on hand? Good question, Meg! Yes, I think regular sugar in place of the turbinado would be fine. Since you’re only adding 3 tablespoons to add a bit of sweetness, I think a wide range of sugar and sugar substitutes would work. Maybe even a tablespoon or two of honey would suffice. Hi Beth! I’m sorry I don’t provide nutritional breakdown details, but I am certain that these scones are much lower in fat than most thanks to the fat-free yogurt. When I saw the greek yogurt in the recipe I knew I had to make these scones. What a great way to save calories and not sacrifice taste. I made a batch today and they are heavenly! Light and moist, but still crunchy on the outside. Thanks for the amazing recipe! I’ll be saving this one for sure. Oh. my. goodness. I’m a fan of this recipe for life. They turned out great, I just baked them for a few extra minutes to get them nice and crispy. Delicious! Yes! So glad to hear it, Erin! 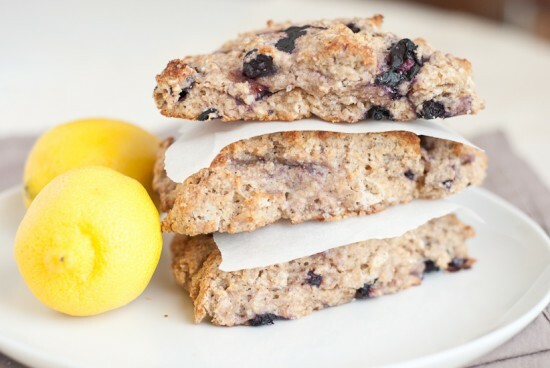 I really want to try these scones with cherries this summer, and fresh cranberries and orange zest next winter (somehow I never got around to it this winter). These had lovely flavour and I loved the moistness from the Greek yoghurt..I used strawberry as I didn’t have any plain…YUM! I found that 400 was too high as they browned quickly but weren’t finished in the middle so I turned the temp down to 350. Thanks for the great recipe! So delicious and easy as well – my three year old helped make them this morning. Excellent base scone recipe. Can’t wait to try with other fruits/flavors. Thanks!! Thanks so much for your feedback, Emily! I’m so glad your little one got to help. I can’t wait to try making these scones with fresh strawberries and cherries this summer! I was wondering if I could use soy for both the yogurt and milk? Have you ever tried it? I think I may just to see how they turn out! Hi Julia! I haven’t tried either, but I’d love to hear how the scones turn out with those substitutions! I bet they’ll be great. Making these tonight for an early morning road trip! They are in the oven and look more blue than yours but my biggest thing was the pastry flour so I found a calc with cake flour and extra regular whole wheat flour…. But was not easy to make into a circle and cut so made individual ones. The batter tastes great so I am sure they will be wonderful cooked! I found your blog a couple of days ago and I am in love! From all the desserts and sweets I’ve made, I have never made scones. I guess I am intimidated by them. :x But because of your clear instructions and tips, I think I will give them a shot; thank you for sharing! Thank you, Jessica! I hope you get a chance to make the scones soon. I promise that if I can make them, you can, too! These scones have become by go to scones. I’ve made them with blueberries and raspberries and I absolutely love them. Can’t wait to try your other recipes! Happy to hear it, Ana! Thank you for commenting! Hi Josheph, if I remember correctly, I used a chef’s knife or serrated knife to cut the slices. Then I think I used my chef’s knife to wiggle underneath each scone and remove it from the rest. I absolutely looove scones and I’m SO GLAD I found your recipe! I love your blog and could sit and read for hours! I tried your recipe this weekend for a bake sale and my friends LOVED the scones. Thanks, Jamie! I’m really glad you enjoyed the scones. I meant to try making some with orange zest and cranberries this winter! Thanks, Kim! I’m glad you enjoyed the scones, even if they spread out a little more than they should have. I think you could really play around with flavors here by adding different berries or mix-ins and changing up the citrus zest. Hello Kate. From your description of how crunchy it is on the outside and soft and tasty on the inside, I can’t wait to make these scones. I am a scone lover and follow all types of gourmet scone recipes but I am new to personal blogs. I normally get my recipes from FoodNetwork or major recipe sites. I have yet to find out the difference between those and blogs. I will usually go to scone mix sections and browse through for some wholesome picks. I found some of them very good but quite pricey. Once I go to Whole Foods and find some WW pastry flour, I will be all ready to try them! Thank you for sharing. Thank you for commenting, Matilda! I hope these scones meet (or preferably exceed!) your expectations. I love using whole wheat pastry flour instead of all-purpose flour in baked goods—you get all the health benefits of whole wheat flour without the wheat-y taste. I use a similar scone recipe, except instead of the butter I use chilled coconut oil and instead of using whole wheat pastry and whole wheat flour, I use ww pastry and oat flour. Thanks, Valerie. I will have to try using chilled coconut oil and oat flour in scones soon. I made these for my 3 kiddos age 4,7,9 and they were a huge hit!! I didn’t have any fresh lemons on hand so they were just blueberry but still delicious. I used fresh blueberries and they were soooo good! I have tried quite a few whole wheat scone recipes lately and I liked that the dough was not as wet/sticky as some others I have tried. Thank you, Amanda! I’m so glad you and your family enjoyed the scones. Would you be able to make the dough ahead of time and refrigerate, then bake them later on? I am NOT a morning person at all and I would love to be able to have these for guests or bring these to morning Bible studies freshly baked instead of making them the night before. Great question, Keira. I haven’t tried doing that, but I’m pretty sure it would work. I’ve heard of people freezing scone dough to cook later, so I think refrigerating overnight should work, too. Yum! These were so great. I was abit sceptical if they would hold up the forzen blueberries (or just turn into a soggy mess), but they kept so well. Nice an crispy on the ouside and perfectly moist and crumbely on the inside. The falavours worked really well. We had some for breakfast and then some when we got home from our week-end run – perfect! 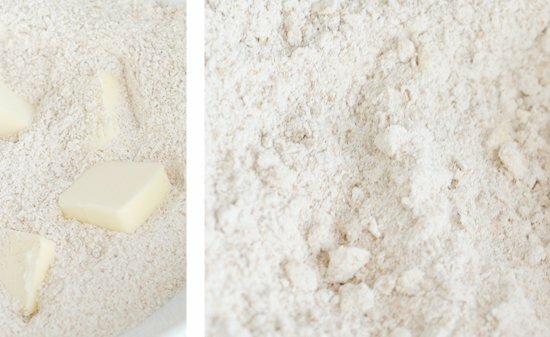 For mixing the butter and flour I used the food mill for my stick blender (Bamix) – super easy (oh, and I left the butter in pices for a few minutes in the frezer). Thanks, Marie! Glad the scones turned out well for you! I’d like to try making a fall version of them soon. I made these today. they were very very good! I added a splash of vanilla to them. That’s great to hear. Thanks, Kelly! Awesome recipe! I did adjust the milk and made it 3/4 c. fresh squeezed lemon juice + 3/4 c. milk and they were a little more lemony. I had to cook mine for 20 minutes. Thanks, Pattie! Glad your scones turned out well! Another way to enhance the lemon flavor would be to rub the zest into the sugar. That’s a trick I’ve learned since posting this recipe that really makes a huge difference. Hi, I made these scones this afternoon, and they are absolutely delicious!!! I’ll make them again and again, with different fruit! I do have a question though. My dough was so wet, I couldn’t cut them to bake separately. I had to bake it whole for 20 min. and then cut. Should I adjust my ingredients? They did turn out fine, but sometimes I might want to bake separately. Hmm. Next time, I’d suggest mixing in a little more flour until the dough is manageable. Sometimes the amount of flour required can be affected by humidity or maybe you had a light hand when you measured it out. Glad they turned out well regardless! 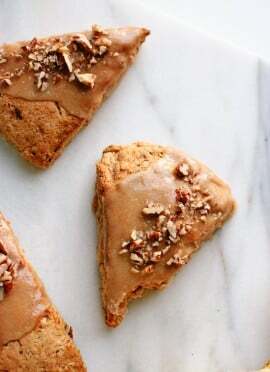 Hi, I want to make these scones tonight but was wondering about a substitution for Whole Wheat Pastry Flour. I have all purpose flour and whole wheat flour but do not have whole wheat pastry flour on hand. Do you know of any substitutions or can i just use whole wheat flour and all purpose flour? Also how do you rub the zest into the sugar? Ready and excited to try this recipe out! thanks for sharing! Hi Irene! Whole wheat flour should be just fine, as long as you don’t mind a subtle nutty flavor. You could also use half whole wheat and half all purpose. Just pour the sugar into a small bowl, add the zest to the bowl and use your fingertips to rub the zest into the sugar. The sugar will turn a pale yellow color and smell amazing! 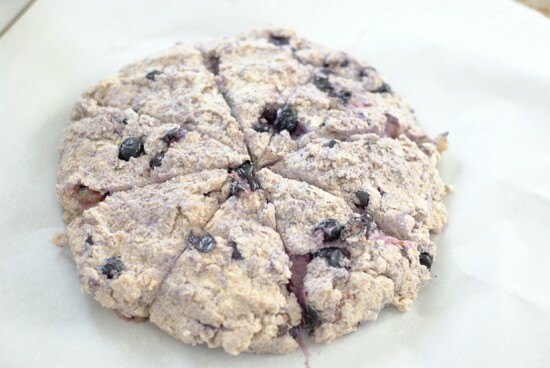 Hi, I was looking for a healthier Blackberry scone recipe and found yours. I plan on substituting in blackberries for the blueberries, I think the taste is about the same. Your recipes looks really good by the way! I am wondering if using almond milk instead of 2% cow’s milk will make a difference? Hi Alexis, I’m sorry for my delay. I think almond milk would work just fine! These were amazing. I brushed them with hazelnut oil and sprinkled some turbinado sugar to finish. So good! Awesome! Thanks, Alice! I bet hazelnut oil is a lovely touch! Hi Kate! These look to die for. Would I be able to use all purpose flour instead for these? Thanks! I think so, but I haven’t tried! 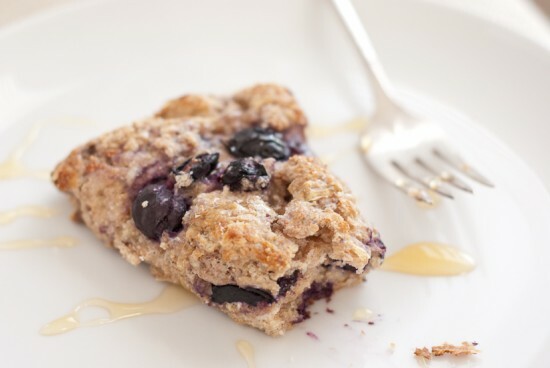 I have been looking for whole wheat recipes, and your blueberry scones recipe is divine. I made them last night, and my son and I had them at 10:00 pm with a glass of milk….awww! 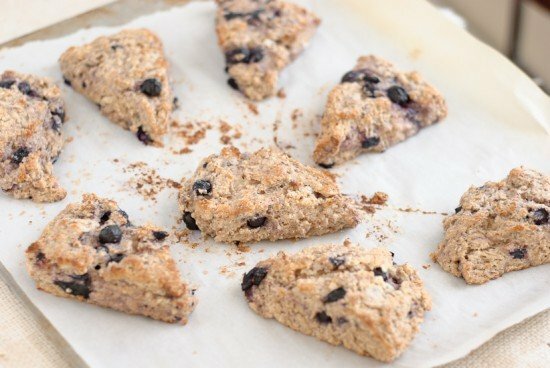 this recipe looks very interesting, and i love scones but is there any way this could be gluten free ? Hi Jess, I suspect that an all-purpose gluten-free flour would work well here. I haven’t tried this myself, but someone commented to let me know that the following combination worked in a derivative of this recipe. She used one cup brown rice flour and one cup almond meal/flour for the two cups of flour. Please let me know if you give either option a try! I am not sure why you have so much adoration, I hope they taste better than they look, which is flat and stidgy looking indeed. As a Scot, livingin in Scotland I would never have the nerve to call these Scone’s. I make plain, fruit, Blueberry & many other option’s, all rise fabulously and use plain, white, & Wholewheat. Yoghurt is of no big healthy substitute really, p,enty other alternative’s, a good recipe with limited sugar & butter is best for Scone’s. Scone’s and Yoghurt, just don’t work really. Picture’s look awful, I am astounded at anyone suggesting otherwise. You must have been having a really bad day. Sorry to hear that, Tracey. Thank you for the recipe! I improvised just a little bit with the help of your recipe (I didn’t have lemon zest, so used 1tbsp of lemon juice, and substituted the 1/2 cup of flour for oats) and they turned out really yummy. Thanks again! Keep doing your thing! I can’t wait to try some of your other recipes! Thank you, Mary! Hope you love the other recipes just as much! Thank you for this wonderful recipe. I made it this morning with the last of our fresh blueberries. Everyone in our family loved them, and I felt extra virtuous because they are low fat and whole grain. I was thinking of smearing blueberry jam on top, for a 1-2 punch of blueberries, but decided against it as they are perfect as is! Hello! I was looking at this recipe and was wondering if by chance any of the flour could be substituted by either oat flour or spelt flour? Hi Sincere, oat flour might be problematic since it’s gluten free. Spelt should work pretty well! Thanks! Also wondering if replacing plain greek yogurt with a flavored greek yogurt would work as well? Yes, but the scones will taste like whichever flavor yogurt you use, and they will be sweeter, too. Just wanted to drop in and say I make these at least twice a month for my family for the last year. My three year old begs me for them! Another perfect batch is in the oven now and I just wanted to to thank you for a healthier recipe that I can make guilt free. Really nice scones, thanks! I was a bit sceptical at first as i didn’t think the mixture looked the right consistency, but they turned out great and the lemon zest makes them really fresh tasting. Can I sub sour cream for the yogurt? I don’t have any. Any other substitute suggestions? These were fantastic! Thanks for sharing Caroline’s recipe. I traded the blueberries out for 5 teaspoons of poppyseeds and added the juice of half a lemon and they came out crispy and soft–just like a scone should be. Glad to hear it, thanks Kate! Yes, I’d use white sugar, and raspberries should work just as well! I have a question regarding the first two ingredients. Hi, whole wheat pastry flour is a lighter version of whole wheat flour. IF you don’t have it, just use regular whole wheat flour. Kate..came across your blog with this scone recipe, that is now a staple at our house! I reverse the flour and use 1 1/2 c whole wheat and 1/2 c white wheat or pastry as I do love the nutty taste. A recent twist I love is frozen raspberries and dark chocolate chips (my husband likes when I use white chocolate even more ;) ) and once made with water when out of milk and it was just fine. I have made these for many friends and they all rave! Thank you for a fabulous and healthy recipe!! Awesome, Candace! I’m glad this is such a good stand-by for you, and that you’ve had fun with experimentation. These came out excellent! I had to bake mine gor 18 minutes. Great! Thanks for the note, Dana. So dope. Every recipe on this blog works out perfectly. I was craving scones this morning and when I googled “easy, healthy scones” your recipe popped up. It took me less than 6 minutes to throw it all together and it was in the oven before my DH could finish the dishes! And they are absolutely delicious!!!! Thank you for the scone recipe of all scone recipes!!! I’m happy to hear that! Thank you for sharing. If you would want to leave a star review, I would really appreciate it! These are super easy and delicious! My husband and kids can’t get enough! I didn’t have any yogurt on hand so I replaced it with the same amount of homemade buttermilk. Very good! Can’t say they were the best scone I’ve ever eaten but I like that they are healthier than my previous favorite recipe. Will certainly make again! Thank you! I’m glad you liked them, Lorraine! I appreciate the comment and review. Ah, yes! :) As for the scones, I froze some of the batch. They’re still perfect when I defrost them in the microwave. Currently eating one of these with orange curd. Just delicious! 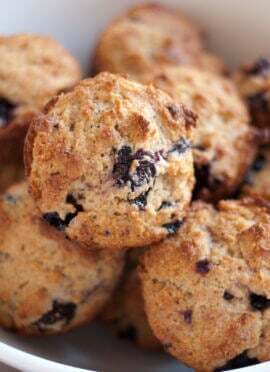 Really moist scone recipe and I love the whole grain and yogurt. I am in a small household so froze half and made the rest in a mini muffin silicone pan. Thanks for another wonderful recipe! What a lovely combination. Thank you, for the review. Do you know the grams of sugar per serving? My 4 year old loves scones but I like to make pretty low sugar versions for him. Thanks much! The nutrition information is below the notes section of the recipe. You just need to click to expand. Hope this helps! :) For this specific, one scone is 8.8g. Oh! Haha I looked everywhere but there. Thanks much. We love your recipes! These were wonderful! So nice that they are not super sweet. The mild lemon flavor was excellent! Yes, I’ve been intimidated by baking scones, but this recipe was super easy. I made them as directed, except I used fresh blueberries and 2% Fage yogurt. They came out moist and flavorful. YUM! Thanks for another great recipe. I will definitely make these again. Hooray! I’m glad you tried this recipe, Vikki. I just made these using raspberries and they are delicious! Moist and flavorful with a slightly crunchy exterior. Next time I’ll do blueberries. I don’t usually make scones, but cutting the fat, using whole wheat flour, and very little sugar and getting a result this good means these will be enjoyed regularly. I’m glad raspberries worked well! Thanks so much for sharing and for your review. Hi – do you think coconut oil would work as a substitute for butter? I haven’t tried with this one! Sorry. Typically it has for other recipes. Very easy. I should’ve kneaded the dough better before adding blueberries. Thanks for your review, Stephanie! I’m happy to hear you loved them, Shelby! Never made scones. What should dough be like when slicing into wedges?